These robust plastic containers are suitable for a wide variety of storage tasks and come complete with a coloured lid to help keep items organised. 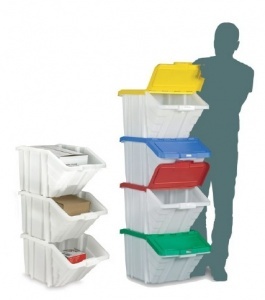 Each 50 litre bin has an angled entry mouth and a hinged front lid section for easy access when stacked. This style of container is commonly used for stock picking, product segregation and recycling but there are a multitude of practical ways to use them in any office, stockroom or warehouse.